U.S. crude production in April 2014 was 8.4 million barrels per day (bbl/d), with two states, Texas and North Dakota, accounting for nearly half of this total. Texas production topped 3.0 million bbl/d for the first time since the late 1970s, more than doubling production in the past three years, and North Dakota production broke 1.0 million bbl/d for the first time in history, nearly tripling its production over the same period, according to data from the U.S. Energy Information Administration's Petroleum Supply Monthly report. 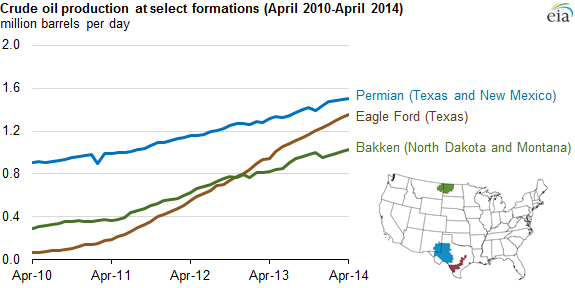 Combined crude oil production volumes from Texas and North Dakota reached 4.0 million bbl/d. From April 2010 to April 2014, crude oil production volumes in North Dakota and Texas grew at average annual rates of 37% and 28%, respectively, versus 2% average annual growth in the rest of the United States. During this period, North Dakota and Texas's combined share of total U.S. crude oil production rose from 26% to 48% (see graph above). By comparison, the Gulf of Mexico's crude oil production share declined from 27% to 17%. Note: Production totals are for all counties that contain part of the shale formations listed above. Gains in Texas crude oil production come primarily from counties that contain unconventional tight oil and shale reservoirs in the Eagle Ford Shale in the Western Gulf Basin, where drilling has increasingly targeted oil-rich areas, and multiple reservoirs within the Permian Basin in West Texas that have seen a significant increase in horizontal, oil-directed drilling. North Dakota's increased oil production comes primarily from counties that contain the Bakken formation, also a tight oil reservoir, in the Williston Basin, where crude oil production growth has spurred a rise in crude-by-rail transportation. Since April 2011, the largest monthly average increase in production has come from the Eagle Ford, with an average monthly increase exceeding 32,000 bbl/d, more than twice the 14,000 bbl/d increase in the Permian. Production from the Bakken increased 19,000 bbl/d on average each month over the same period.